Mass produced footwear does not suit everybody. I cater for people who have difficulty finding shoes in the market place. 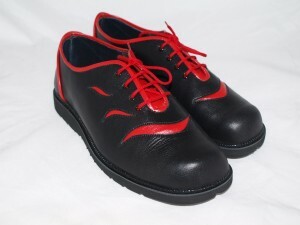 There are different reasons for needing or wanting custom made shoes. You wear orthotics and need extra depth. You may have one foot bigger than the other. Your podiatrist or GP has recommended custom footwear. Extra wide or narrow feet. Extra large or extra small feet. You may require something for a special occasion and simply cannot find what you want in the shops. You may want to design your own pattern and/or choose a colour without being dictated to by the current trend. I aim to provide shoes which suit the wearers needs in terms of design and colour, but also accommodate the physical needs of the foot. Leather uppers and leather lining. Minimal seams on inside for comfort. Wide variety of styles, colours and leather to choose from. Variety of soling available to suit different requirements. Padded insole for cushioned comfort. Optional arch support or comfort footbed. Steel shanks and a variety of heel stiffening. Custom design, appliqué and machine embroidery. I can also custom make footwear for your special occasion, in your choice of style, fabric and colour. Please contact me discuss your requirements and have your feet measured. 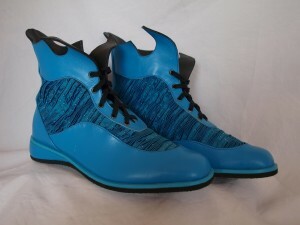 Please click on either of the two images below to see examples of my previous custom footwear and exhibition shoes.